We are accepting nominations for our 6th annual Top 10 Social Media Blogs contest, the biggest contest for social media blogs. 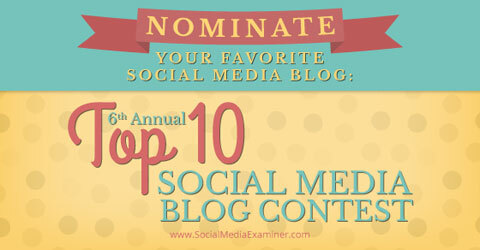 We are looking for your nomination for the top 10 social media blogs. The winners will be promoted in our 320,000-reader newsletter and announced on Social Media Examiner. Please make a single nomination of your favorite social media blog by commenting below and including why you like the blog (only your first nomination counts). Be sure to include a link to the blog (comments with links automatically go into moderation for review and will be posted within one day). Nominate your favorite social media blog for the 2014 Top Ten list. To be considered, a blog must be nominated by two different people. Make your nomination by January 4, 2015. The judges: Our judges include Douglas Karr (author of Corporate Blogging for Dummies and founder of the Marketing Technology blog), Nichole Kelly (author of How to Measure Social Media and CEO of Social Media Explorer) and Pat Flynn (founder of Smart Passive Income). Judges’ blogs are not eligible. 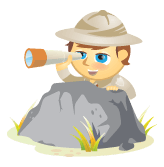 Winners will be selected based on the quality of their content, the frequency of their posts, reader involvement and their blog’s ranking (in that order). Think part readers’ choice and part Oscars. The winners will be announced here in February and also in our newsletter. Click here to see our 2014 Top 10 Blogs contest winners. Note that our judges will decide the final winners. Go ahead and enter your nomination right now in the box below and be sure to let your friends know about this contest.